At the beginning of summer I made a Ploughshare tortoise out of paper mache clay, to test how well it would hold up out in the garden. For many months it did just fine – through rain, downpours, sprinklers, and lightly filtered sun. He lived under a rose bush, since I didn’t think he’d want to be out in the middle of the path, where some clumsy old lady (who could that be?) might trip over him. Then a few weeks ago I moved the rose bush, and the area around the tortoise was temporarily bare. Within just a few days I saw the flaking that you can see in the photo above. The direct sun caused damage, even though all the rain did not. I guess that means he’s waterproof (I used spar varnish) but not weatherproof. Dang – I had a whole menagerie planned for my garden and yard. I thought it might keep me busy this winter, when I couldn’t be outside digging in the dirt or hanging out with the chickens. More research is needed. This should not be insurmountable. Boats have been made out of paper, and they were fine, waterproof craft. And paper mache is not much different than any composite wood product. Britta left a comment today, including a photo of her new Indian elephant, which she made the same way as the one in my elephant video, but using mortar instead of the paper mache or paper mache clay. If some concrete waterproofing stuff was painted over the elephant, she should last a very long time outside. But can the mortar be painted for brightly colored storks and other odd critters? 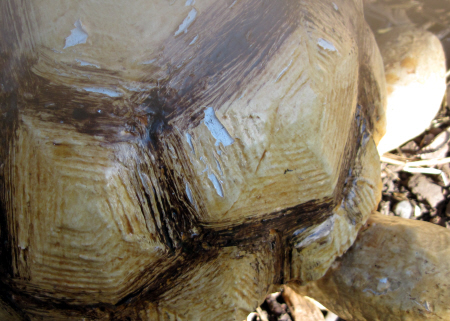 The failure on the tortoise is in the paint and varnish shell, not the paper mache clay beneath it, so perhaps acrylic paint would cause the same issues on a mortar sculpture. In fact, maybe it isn’t a problem of weatherproofing paper mache, but simply a matter of finding the right kind of paint to go on over it. Any ideas? I know there are a lot of folks out there who want to use the paper mache clay or traditional strips and paste for outdoor art, but so far I haven’t found the solution to the weatherproofing problem. Your ideas will be much appreciated. (I think a sculpture garden would be so much fun!) If you think you know the answer to this problem, please leave a comment. The original thinking in outdoor sculpture, generally use concrete or metal items, so afraid of the rain, see your information, you can try down. Dear Jonni, Thank you for all your information.I have made about four paper mache projects so far.So much to learn. I’m making mostly miniature trees and experimenting now with different sugestions im finding on your blogs.My first trees i covered in a brown floral tape and sprayed with a clear acrylic sealer.I also added a set of led lights under the floral tape. I used a gorilla tape to secure them to my paper mache fairy tree. I took shrink y dink plastic and punched out large flowers,and punched out small holes in the middle of the flowers and used a heat gun and made cherry blossom light covers for my paper mache tree.Added some really cool greenery that looked like it belonged on a weeping willow and it turned out great.So thank you for all your suggestions. I’ve been searching to make a big sculpture and landed on your site…i have made small sculptures with air dry clay ,painted them with “exterior acrylics paints then varnished with “outdoors”varnish. it lasted one summer and late fall a few started to crumble…so I took them and painted them with my Paverpol products..yes I became a Paverpol teacher last year….love it. love the product. I am also wondering if it’s because my sculptures were all on the ground…with the Paverpol , they sugest we stick our sculptures to Posts or rocks but i never saw a picture with the art project on the ground…we work with an wire armature,,foil to form the body, masking tape ..then dip strips of T-shirts in the product to cover the foil/masking tape. When we are done….we dry brush with acrylics paints ..wait 2 wks and paint with the companies varnish or your fav. stores exterior varnish…I have 2 snowmen outside in the snow since nov. They are doing well. My teacher explained how important it was too make sure that all cracks were covered in order not to let moisture inside. I think it would be worth you looking up the site…the paverpol itself it exterior proof. You have a lovely website. Do you know if there are any online lessons in how to use Paverpol? I’ve heard a lot about it, but I’m not sure how it’s used. It would definitely be best to keep any sculpture that may attract mold or other critters at least a few inches off the ground. Soil is teeming with life, and lots of the beasties would be happy to move up into a paper mache sculpture if it wasn’t really well protected. Even the smallest pinhole would give them a chance to move in. No problem! The Paverpol seated lady is on my blog, under ‘Contemporary Craft Retreat’. What I forgot to say is that the Paverpol lady is made from wire, foil & fabric BUT I will be putting out a Papier Mache sculpture coated in Paverpol soon. I was going to coat one of my clocks and put it outside, but I don’t have any clear Paverpol, just a bronze bottle which I won at the craft retreat. I hope to make something over the weekend & get it outside for some weather testing! FAB website btw, I’m going to try some of yr recipes as I’m looking for an alternative to the 50lb sack of Sculptamold I have as it can only be purchased in small bags overe here (it emigrated with us from the UK, along with the rest of my craft stash!). Denise at Paverpol said it wil work over natural fibres/products, just not plastic. Denise is really great, so if you have any questions, she’s our Aus disty over here. I’m told Paverpol should do the trick, I’ve yet to try it myself & will be sticking my Paverpol Seated Lady outside tomorow and see hpw it goes (we’re heading in to Summer in NSW & it’s hot, hot, hot already, but a dry heat rather than humid). I have heard a lot of people suggest Paverpol, but you’re the first person I know of who is actually trying it out on paper mache. (I intended to, myself, but I got sidetracked…) Be sure to let us know how it turns out. I’m especially interested in how the finish holds up in the sun – that’s what caused the damage to the marine varnish on my tortoise. Rain ran right off it, but the sun cracked the varnish. If the Paverpol holds up, I definitely want to know. And could we see your Seated Lady? Have you posted a photo of her yet? Alice, were you trying to add some images to your comments? You’ll need the entire URL, beginning with the http. Please try again – we’d love to see them. Maybe you should try a marine grade paint. It is oil based so clean up is more work but the stuff survives years on the decks and sides of boats with out damage from water, sun, salt ect.. I know that it comes in many colors standard and there are places to get it mixed to your color choice. The other suggestion would be car paint with an automotive clear coat finish. Thank you for the links. I am still and almost done with my Cheshire Cat Mailbox. I have used several products to waterproof it as I go. Paverpol with Paverpol Plast have been my favorite so far but love the idea of the waterproof glue. Why don’t you use waterproof glue in the paper mache paste? Something like TiteBondIII? http://www.titebond.com/ProductLineTB.asp?prodline=94&prodcat=1 It’s water soluble until it dries and you do not need to wear gloves to use it. The only disadvantage that I can see is that it has a pot life of about 20 minutes once mixed, so you would have mix and use small batches. That would give you a waterproofed paper product. Then you paint it with an outdoor enamel with UV protection. http://buildingmaterial.indiabizclub.com/catalog/41516~exterior+wall+paints~pune You can tint white enamel with most powdered paints. Top this off with Marine Varnish http://www.amazon.com/Man-Spar-Varnish-Gloss-Quart/dp/B000HEHESU and you should have a fairly weather hardy item. Great ideas, Rosmary. I’ll check out those links.